Evangelos Foskolos is from Greece,born in 1990 and has studied Statistics. 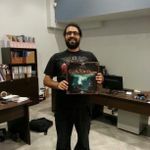 He is a co-founder of Drawlab Entertainment on 2014, publishing his first board game, Spells of Doom. In the past, he has worked as a board-game explainer for several years in one of the most well-known boardgame cafes in Greece.